If you’ve seen our previous video, you know we’ve been talking about the website called VictoriyaClub.com. You will find the first part of our review of this website in this blog post. We were asked by many to address the SEO questions more closely because so far we only touched upon them lightly. Today we shall go back to this website, look through different aspects of search engine optimization used here, see what was done well, what needs improvement, and generally just share some useful information with you to help you boost your site’s popularity. Watch our new video or keep reading. Let’s start with is the domain name of the site. Although having a brand new domain name does sound nice, it’s actually more efficient to have a domain of a certain age. Older domain names have more weight in the search results, and that can influence your position in the search. Search robots tend to give preference to well-established domain names that have been in their database for years. When competing with newer domains, e.g. by the same keywords, it increases your chances of being clicked on and of attracting new visitors. We see that the ‘victoriyaclub.com‘ domain was registered in 2013 which adds to its popularity that we discussed in our previous video. Although the footer of the website states that it has been online since 2008, they probably moved their business to a new domain name at some point. Some of the major domain registrars like GoDaddy offer domain name auctions. There, you can find a domain name that will match your idea. You will also be able to see the age of the domains. This might help you get better results from the beginning. Back to the SEO audit. The way it works is that your site pages are fed to the search engine robots. The robots inspect every page of your website, collect information, and are able to pull your website up in search when someone’s searching for something that you offer. A good rule of thumb is to close system pages, like control panel pages from being indexed. We are using Yandex Webmaster tools to check the robots.txt file but you can use other tools like TechnicalSEO. Disallow: /admin/ means that the administration pages are closed from indexation which means that links leading to the control panel will not come up in the search. It’s good for security reasons but some site owners still forget to do that. Another good thing to think about is the friendliness of your site’s URLs. We’ve checked the Victoriya Club website with the PrePost SEO service. It says that most URLs are friendly with the exception of the profile links. This is because the website uses both nickname, user id, and age to create a unique URL. The problem with that is that some of this information is not static. People will grow older each year, or they may wish to edit their nickname. Any changes in the URL might affect the page’s rank. It is advisable to use static URLs for important pages. Of course, PrePost SEO is an automatic tool that may not take into account certain aspects of your site like pop-up windows that open when you click a button, and may give you an error when there is none. Still, you get a general idea of where to go. Another thing we’d like to draw your attention to — and that’s a major issue for the VC site — is the duplication of the content. Duplicate content is never ok because it creates a non-necessary mess of links leading to one and the same page. Why is it not ok? The search robots will find multiple pieces of similar content on a site and may find it hard to decide which version is more relevant to a given search query. They will only pick one of the pages to show up in search results which means that the rest of the pages with duplicate content may never become visible. On the VC website, some of the links to pages with identical content redirect to a single page, which is ok, but for other pages, several versions exist simultaneously. Let’s take a closer look at that. VC site has two blogs, one for English-speaking viewers and another for Russian viewers. Another issue is that they don’t check the availability of the content on a page. 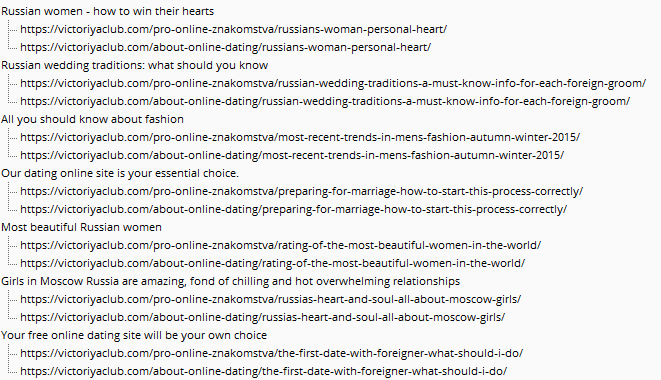 For example, this https://victoriyaclub.com/pro-online-znakomstva/dating-russian-ladies/qweqweqwe appears to be an existing page with a nonsense URL. It shows the content from the page we were on previously. That also helps to spread the duplicate content. It’s basically collecting rubbish on your site, beware of duplicate pages. For a lot of pages on the VC site, this text exceeds the recommended length of 70 symbols. The issue mostly applies to the profile pages. Just as with the URLs, VC uses different parameters to form the title tag: ID, name, location, age, hair colour, eye colour, but omits keywords. Unique description tags are recommended for every site page open to the visitors. The tag length should be within 70-160 symbols. A meta description is used in the snippets and affects the click-through rate along with the position in search results. While the VC site does use headers, it does not use them for the original purpose of including the keywords by which the website is promoted. The H3 titles like ‘Real stories of single girls’ or ‘New Single Girls’ are rather used as stylistic means to structure the information visually, not as logical markup to promote the keywords. The site owners miss out on the potential that the proper use of titles can give them. We asked ourselves a question: How does the site attract its audience if it does not use the keywords where they are supposed to be used? The answer to the question turned out to be a bit unexpected. We found out that the website randomly assigns a keyword or a key phrase to promote pictures. If we look into the HTML code of a profile page, a script appears to assign different keywords, by which the website is promoted, to random photos on the website. What it does, ultimately, is that it helps these pictures to be placed higher in search when you’re searching for pictures. It’s no wonder that the VC profiles are easily found on Pinterest, the ‘visual discovery engine’. The site owners seem to be ok with that, so this may be the go-to place for their target audience? Again, we see more potential here in terms of SEO and promotion. We do hope you now have questions about how to promote your dating site because that’s something we can help you with. If you’re interested to learn how you can improve your search position, or how to deal with search engine optimization in general, feel free to contact us in the live chat or join the discussion in the comments below.